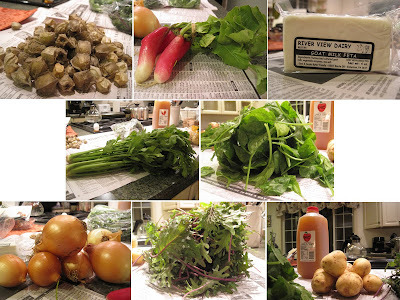 Yum Yum: CSA #28 - Ground Cherries?! CSA #28 - Ground Cherries?! We have only 4 more weeks for this year's CSA. We still have horseradish, celeriac, and turnips from weeks past rattling around in our veggie bin - looks like we might have to do some veggie roasting this weekend! Meanwhile, our new CSA goodies brought us a 'new to us' item: ground cherries. They look like cute, mini tomatillos to me! Ground cherries (husk tomatoes), breakfast radishes, goat milk feta, celery, spinach, white onions, red Russian kale, apple cider, and gold potatoes. "Husk tomatoes are neither cherries nor gooseberries. Their papery, Chinese-lantern-like husks offer the best clue as to their pedigree. Like tomatillos, husk tomatoes belong to the genus Physalis, which is a member of the Solanaceae family, better known for producing peppers,eggplants, potatoes, and tomatoes. Husk tomatoes are turning up more frequently at farmers’ markets and CSAs due to their unusual flavor and heirloom quirks. About the size of a blueberry, a ground cherry tastes similar to a super sweet cherry tomato, with a hint of — strawberry? Mango? What is that mysterious flavor? Not only are husk tomatoes addictive out of hand, but they’re great tossed into fruit salads, scattered over green salads, or chopped into a terrific relish for ladling over fresh grilled fish or scooping up with tortilla chips." I'm looking forward to trying them. More and more I'm coming to regret not purchasing as CSA subscription this past summer. What a wonderful way to expand your tastes. I've had ground cherries as part of a relish that also included sweet peppers and onion. We used them to top curried empanadas. I definitely recommend trying them out in a salsa or dip. They have a unique flavor that makes them suitable for sweet or savory, and they work really well with spice. I am jealous of your cider, and I love that you get so many goodies from your CSA!